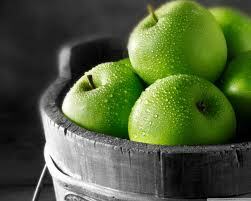 Green apple is a flavor you might taste in beer, but is not typically desirable. 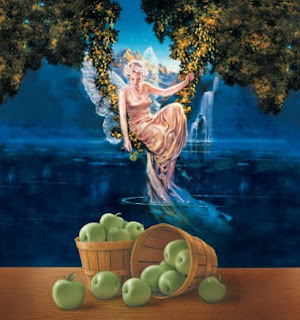 The compound that causes green apple flavor in beer is acetaldehyde, a precursor to ethanol formed during fermentation. This same chemical also gives yogurt that “tangy” taste, and is added to soft drinks and candies. If you like the green Jolly Ranchers, you have acetaldehyde to thank for your candy’s flavor. Almost all beers contain trace amounts of acetaldehyde, between 1 – 4 mg/L. However, higher concentrations (5-15 mg/L) can be unpleasant. High concentrations of acetaldehyde form in beer when the yeast aren’t given enough time to convert it into alcohol after fermentation. This often happens when the beer is racked too early, and the beer is said to be too “green”. Proper conditioning of the beer and a longer aging period gives the yeast time to metabolize the compound and convert it into ethanol or acetate. Éphémère, verb: Existing only for a short time. However, one brewery has used acetaldehyde to their advantage. Unibroue from Quebec has devised a brew called Éphémère, a refreshing light-bodied wheat ale with notes of green apple. It's not overly sweet for a fruit beer, and yet the tartness is not overpowering. Last week I celebrated my favorite March holiday. No, it wasn’t St. Patrick’s day. Although I welcome any excuse to drink beer, my family is from the another British isle. I’ll save my pint for Robbie Burns day, and celebrate my ¼ Scottish heritage instead. I’m talking about pi day. Without this noble number, it would be impossible to measure the circumference of a cask. Or the area of a keg. Or the volume of beer in a glass bottle. Or the quantity of pie I have yet to eat. I have included a recipe for a dessert pie I made a while ago as well. Try to wrap your head around this: an apple pie INSIDE an apple. Pie-ception. Next time, I might poach them in Éphémère or a sweet and spicy ginger beer, for another layer of flavor. Chicken, taters, gravy, bacon, and biscuits. Comfort food doesn't get any comfier. In a large bowl, sift flour, baking powder, and salt. Add the ¼ cup butter in pieces. Cut with a pastry cutter until the mixture is crumbly. Add the cheese, bacon, beer, and milk, stirring until everything is moistened. On a lightly floured surface, knead the dough until a rough dough is formed. Roll out the dough to 3/4-inch thickness. Using a 2 1/2-inch round cookie cutter or glass, cut out about 12 biscuits. Heat oil in a medium frying pan. Add the onions and garlic to pan with a pinch of salt, and sauté until translucent (about 5 minutes). Set aside. Melt butter over medium heat in a saucepan. Add flour and whisk to form a roux. Slowly whisk in the chicken stock and milk to the roux. Bring to a boil. Once the stock is boiling, reduce heat and simmer for 2 minutes. Combine chicken, onion mixture, sweet potato, and corn in a large casserole. Pour stock and milk gravy over all ingredients and toss to coat. Arrange the biscuits to cover the surface of the pot pie. If you have extra biscuits, they can be baked separately on a baking sheet. Bake for 25-30 minutes, until the biscuits are golden brown and chicken filling is bubbly. Hot from the oven and melting my honey heart. And hopefully my honey's heart. An apple pie...inside an apple. Cut off the top of 4 apples off and dice edible portion of caps. Also slice a small piece off the bottom so the apples will stand on their own. Remove the inside of each apple with a spoon or melon-baller very carefully, salvaging as much as you can for the filling. If you can’t save enough of the apple interior, peel and dice the fifth apple for the filling. Toss diced apples with sugar and cinnamon in a bowl. Gently fill the apples with the diced and spiced apple filling. Roll out pie crust and slice into ¼ inch strips. Cover the top of the apple in a lattice pattern with pie crust strips. Remove foil and bake for an additional 20 minutes or until crust is golden brown.